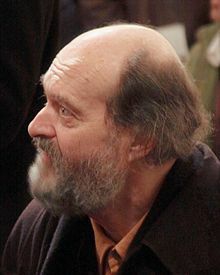 Arvo Pärt (Estonian pronunciation: [ˈɑrvo ˈpært]; born 11 September 1935) is an Estonie componer o clessical an releegious muisic. Syne the late 1970s, Pärt haes wirked in a minimalist style that employs his sel-inventit componeetional technique, tintinnabuli. His muisic is in pairt inspired bi Gregorian chant. His maist performed warks include Fratres (1977), Spiegel im Spiegel (1978), an Für Alina (1976). Pärt haes been the maist performed leevin componer in the warld for five consecutive years. ↑ "Answers - The Most Trusted Place for Answering Life's Questions". Retrieved 6 September 2016. ↑ "Estonian Arvo Pärt listed as most performed living composer - News". Retrieved 6 September 2016. This page wis last eeditit on 23 Februar 2018, at 19:31.